UPDATED AGAIN 10-8-14: Kellogg drops $250K against GMO food labeling + other contribution updates to the YES and NO positions. 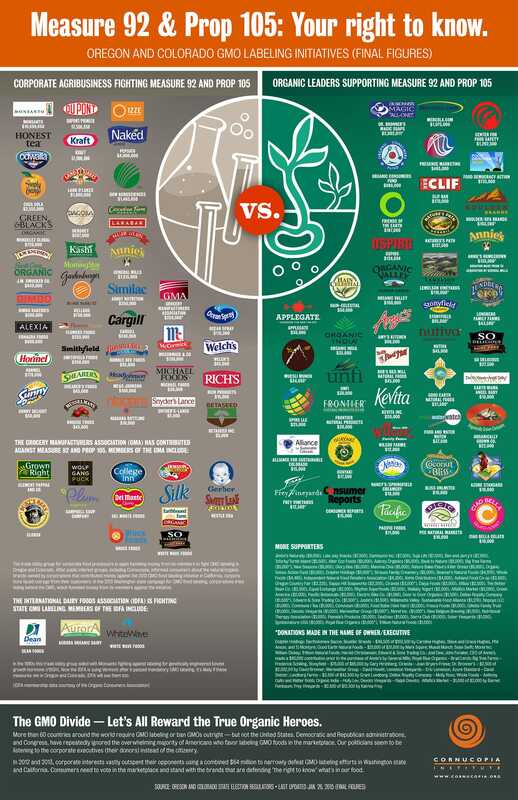 UPDATE 10-2-14: Cornucopia’s GMO food labeling infographic has been updated and now includes the contributions made to the Oregon Right to Know committee, which was organized to help get Measure 92 on the ballot. (Information on contributions for petition gathering are listed separately by the Oregon Secretary of State’s office and were not previously included.) This update also includes significant additional contributions reported over the last couple days to both the Vote Yes on Measure 92 committee in Oregon, and the Right to Know Colorado committee. Stay tuned for additional revisions of this infographic based on campaign finance reporting deadlines in Oregon and Colorado! For a larger, easier to view version of the infographic please click on the image. Once downloaded (please be patient) you can click a second time to enlarge that further. A high-resolution file, suitable for enlargement and printing, can be found at the linked pdf below the graphic image. Mandatory labeling of genetically engineered food ingredients (commonly called GMOs — standing for genetically modified organisms) at the state level is viewed as a watershed event by many industry observers, given the prolonged inaction at the federal level. Earlier this year Vermont passed a state law requiring GMO food ingredient labeling, and the states of Connecticut and Maine have adopted similar legislation that will take effect when other neighboring states pass such laws. At the national level, Monsanto, its biotech allies, and the GMA in particular, have been credited for bottlenecking action on a federal law although they have recently rallied behind a new proposal that would outlaw state GMO food labeling laws while permitting “voluntary” labeling by companies of such ingredients (voluntary labeling is already being allowed by the FDA). North America’s largest independent organic breakfast foods manufacturer, Nature’s Path, has been actively promoting and funding a “yes” vote. “Nature’s Path USA has supported citizens’ fundamental right to know if their food contains GMOs, with a simple label declaration. Then they can choose whether or not they want to buy it,” says Arran Stephens, the company’s CEO and cofounder. “One of many great qualities of organic agriculture is in the superior taste and higher nutrient profile — the natural result of a farming system that emphasizes long term soil fertility, farm family security and non-toxic ecological balance,” Stephens added. Other prominent commercial backers of state citizen initiatives, viewed as heroes in the organic movement, include Dr. Bronner’s and Bob’s Red Mill. “As a lover of science and as an activist, it’s clear to me that labeling genetically engineered food just makes sense. Consumers have a right to know whether the food they’re eating has been genetically engineered to withstand huge amounts of pesticide that contaminates our food, wreaks havoc in the environment and ends up on our dinner plates,” says the company’s CEO David Bronner, describing why the company has donated $715,500 to the state initiative campaigns. Additional organizations throwing their financial weight behind the consumer’s right to know include the Organic Consumer’s Fund, Food Democracy Action and Mercola.com and Presence Marketing. The biggest single donor to the “NO” vote is biotech giant Monsanto, having poured more than $6.3 million into the state campaigns. Pepsi has donated $2 million and General Mills has donated more than $1.5 million. Other heavyweight opponents include Kraft, Dow AgroSciences, J.M. Smucker, Land O’ Lakes and ConAgra. All told, opponents of the consumers’ right-to-know what is in their food have already raised more than $15.1 million, while supporters of the state initiatives have gathered nearly $3.3 million. “We doubt if loyal customers of Naked Juice (PepsiCo), Dagoba chocolate (Hershey’s) RW Knutson or Santa Cruz juices (Smuckers) realize that their corporate parents are taking the profits from their patronage and stabbing them in the back by investing to defeat GMO labeling on food packages,” the Cornucopia’s Kastel lamented. Data for the campaign contributions was gathered from appropriate state regulatory agencies. The Cornucopia Institute’s board of directors has formally endorsed the Oregon state initiative (they have yet to meet and take action regarding the Colorado initiative). Next : Meanwhile, Whatever Happened To Al Qaeda? ?